Eco Vessel's BOSS is a vacuum insulated growler that you can fill with icy cold craft beer at the brewery or fresh hot coffee from home or your local coffee house. Includes is a removable stainless steel infuser, so you have the option of adding the flavors of fresh fruit to your drinks. If you’re a tea enthusiast, fill the infuser with leaves and the Boss will be your favorite tea maker. On a summer day or warm evening, pour some wine in the growler, add sliced of oranges, limes, pineapple and enjoy refreshingly chilled sangria that will stay cold all day - perfect to take on a picnic or day at the beach! This growler features Eco Vessel's vacuum TriMax® triple insulation technology and has been tested to keep liquids cold for 36 hours and hot up to 8 hours. 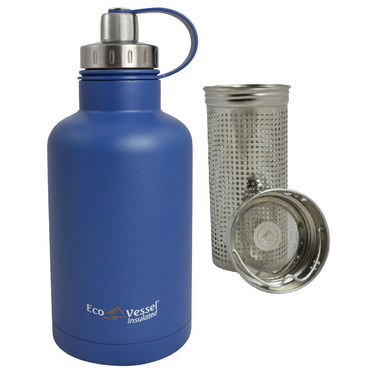 Its dual use leak proof top has a wide opening for easy filling and a small opening for easy drinking. A versatile vessel for anything! Keeps liquids icy cold for hours...perfect fro travelling and decanting into smaller drinking cups!